We’ve spent some time in this space discussing the growth of the suburban lab market. 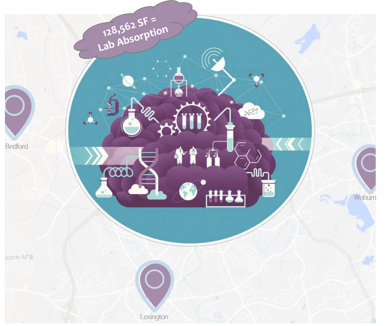 That trend is fully manifested in the Route 128 Northwest submarket in 2018: Year-to-date, it has posted 341,243 SF of positive office/lab absorption, of which 38% (128,562 SF) has been to lab tenants. This is notable, since the share of the lab market in that submarket is just 14.5%. Lab is fighting way above its weight class! Lexington has been the main beneficiary of this trend, while Bedford and Woburn have also seen gains. Some of the largest deals of the year include Concert Pharmaceuticals and Accent Therapeutics in Lexington, Homology Medicines in Bedford, and Ultragenyx Pharmaceuticals and Lionano in Woburn. This level of demand will be difficult to maintain as vacancies begin to dwindle. However, with plans for some additional product and lab users (even if not life science players) looking to areas such as Woburn for growth opportunities, 128 Northwest will remain front of mind for tenants — and should be for investors as well.